While studying biochemistry in college, Jeremy decided to try his hand at something outside of the sciences and enrolled in a wheel throwing ceramics elective class. He enjoyed the class so much he took signed up 5 more times and has been hooked ever since. Upon graduation, Jeremy started work in the pharmaceutical industry but has continued working in clay when time allows. After getting comfortable with the basics, he found an interest in applying various surface textures to the basic wheel thrown shapes and playing with different firing techniques to highlight these textures. 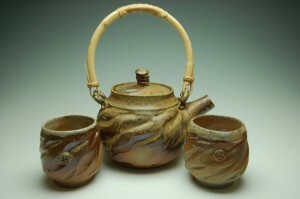 He primarily creates functional pieces using stoneware clay, fired to cone 10/11 in either a gas or wood kiln.